A collectible calendar. 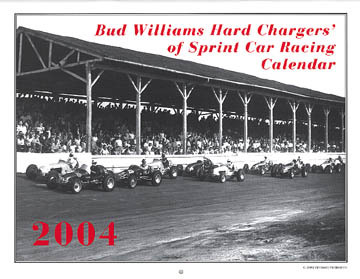 This makes the fifth year for this Bud Williams calendar series and this is the best one yet! Printed on glossy paper for the first time which almost brings these black & whites photos to life. You can almost hear the engines running. You will see Ted Horn driving "Baby" in January to Tommy Hinnershitz dueling beside Johnnie Parsons in December. In between will be great action photos. You will see Bert Hellmueller racing against Bud Randell at the Minnesota State Fairgrounds; Allen Heath dueling Jerry Hoyt at Terre Haute; Roger McCluskey, Jim Hurtubise, Chuck Hulse going three wide at Terre Haute; A.J. Foyt in classic form at Terre Haute; Rex Mays broadsliding at the Indiana State Fairgrounds in 1946; Pat O'Connor going wheel-to-wheel with Ernie McCoy at Dayton; Jim Hurtubise chasing down Steve Stapp at Terre Haute; Parnelli Jones being chased by Don Branson at IRP; Larry Crockett trying to pass Ed Ellison at Fort Wayne; Leroy Warriner driving Troy Ruttman's ride, Agajanian 98 Jr., in a wheel-to-wheel duel with Don Freeland at the 1953 Dayton 100. Only the best photos by Bud Williams, Rick Johnson, Bob Stolze, Dave Knox, John Hyland, Al Herman, and Greg Sharp were used. A special tribute to the late photographer Rick Johnson.